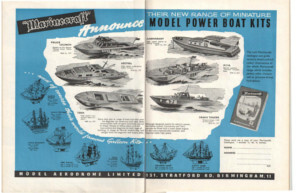 The 'Small Power Boat' series was released in 1959 - around the same time at the KK EeZeBilt series, with which it had a lot in common. Both series were comparatively cheap small power boats made in thin balsa sheet, priced and aimed at young modellers. But there are differences. 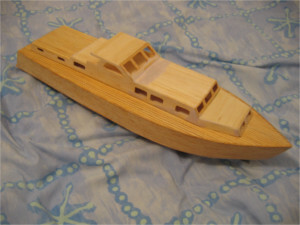 The Marinecraft range was based around a single hull with different superstructures, it featured a somewhat bigger, simpler and stronger hull with its strength in a thick keel and decks, while the EeZebilts were smaller and had a more sophisticated construction with the strength in the bulkheads and 'eggbox' structure. See the Catalogue page. The range was sold as suitable for electric or small diesel, the latter being a bit optimistic for an 18" boat, though the hull does have a wide beam. With a single hull shape, the two military boats are hardly scale! But the building is easy, superstructure access is superb, and the boats would make ideal starter kits for youngsters with a small modern radio control. We have reverse-engineered the cutting lines, which are available for free below, as well as the Model Maker 1960 review for the range. Alas, no instructions yet - I need to write some... Happy building!